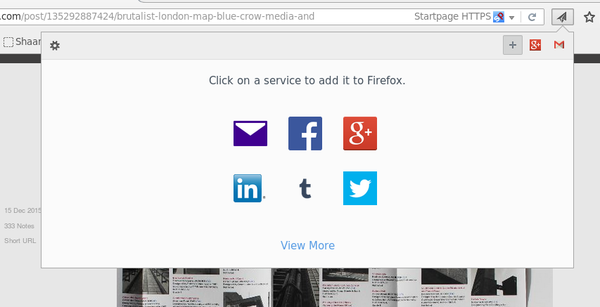 The Share This Page button in the Mozilla Firefox browser is hidden by default -- which is a crying shame, as it offers an easy way to share the current web page through different services. To add this button to the browser's main toolbar, click on the hamburger button and choose Customize. Drag then the Share This Page icon to the desired location on the toolbar. Out of the box, the page sharing feature supports a handful of services, including Facebook, Google+, Twitter, Tumblr, and Yahoo! Mail. Activating the service you want is a matter of clicking on the appropriate icon. And you can enable multiple services, too. In addition to the default sharing options, you can choose other services from a growing list of supported platforms. To do this, click on the View More link, ands press the Activate Now button next to the desired service.